An m-rep represents a single object as a set of connected meshes of medial atoms. There is a main figure and possibly a set of connected subfigures, each represented by a single quadrilateral (or other topological) mesh of medial atoms. The single green mesh is populated by 8x3 yellow atoms. 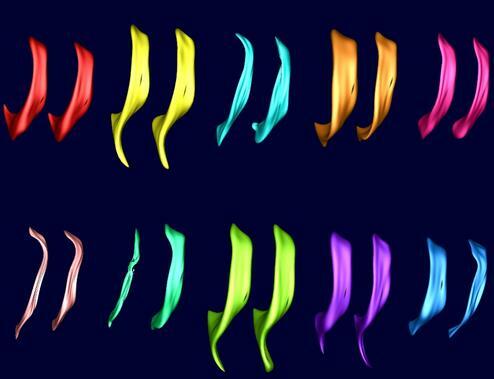 The other colors indicate each atom's frame. The surface implied by the interpolation of the frames of the atoms. This multifigure surface is created by blending the implied surfaces of two figures. 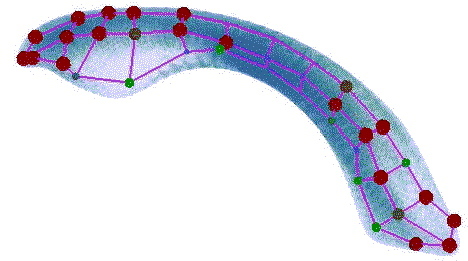 The meshes are connected by a subfigure having at one end of its mesh "hinge atoms" that ride on the implied boundary of the parent figure. The hinge atoms of the red child figure are circled in red Without blending, individual figures may be seen Hinge atoms determine where blending takes place. An m-rep model is typically built from a population of trading instances of the object. Left and right hippocampi from a population of individual brains. An m-rep represents the population by minimizing the difference between the m-rep's implied surface and any surface found in any individual. Models for multi-object complexes are built by figures in one object "knowing" the position or part of their surface in the figural coordinates of a nearby figure of another object. The gray region of the child figure is sensitized to be a specific distance above a specific position on its parent figure.